GeoDigital wants to turn the physical world into data -- and then turn that data back into real-world intelligence for electric and gas utilities, telecommunications infrastructure build-outs, and perhaps someday, self-driving cars. That’s a brief introduction to the markets the Hamilton, Ontario-based company is targeting for its revamped technology platform. 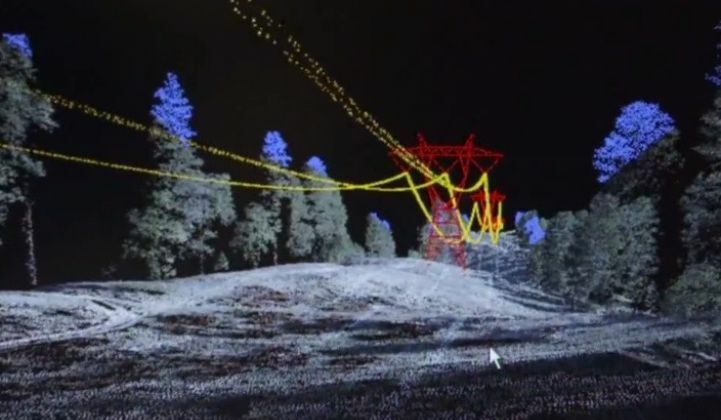 Founded in 2005, GeoDigital got its start turning helicopter LIDAR (light detection and ranging) flyover data into 3-D maps of utility transmission grid corridors to find out where trees were threatening to short out power lines and prioritize which ones needed to be cut back first. GeoDigital bought mobile workforce management technology provider Powel in 2011, giving it a platform to deliver its data analysis to field crews and line workers. The company then branched out into about nine different industries, serving customers on a project-by-project basis, CEO Chris Warrington told me in a recent interview. Now the privately held company is back to profitable status as of the end of last year, and it expects 30 percent to 35 percent year-over-year revenue growth in 2015, he said. According to a 2014 Wall Street Journal article, the company’s revenues last year were in the $30 million to $40 million range. The firm has also added many more sources of data to its platform, from video and photo images to wireless sensors and alarms common to the industries it’s picked as its target markets, said Warrington, the former president of the Americas operation of Ventyx, the software arm of grid giant ABB. The assets in question can be electric transmission lines that cross hundreds of miles of remote territory, like those it’s mapping for new utility customers including Xcel Energy, and most recently, Pennsylvania-based PPL Electric Utilities. Beyond LIDAR data, GeoDigital correlates temperature, humidity and wind conditions prevalent in the area to plot out where and when nearby tree limbs may come into contact with the power lines, he said. 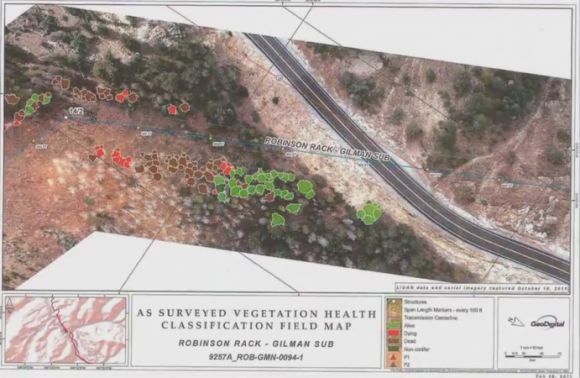 With that information, “the utility can surgically remove the offending trees or branches” while avoiding expensive and environmentally unfriendly cutting away of broad swaths of vegetation, Warrington said. After the 2003 blackout that darkened much of the ortheastern U.S. and southeastern Canada, federal regulators ordered utilities to inspect, clear and maintain more than 450,000 miles of high-voltage transmission lines, at an estimated cost of between $4 billion and $10 billion, making it a key area for utilities to find ways to cut costs while sticking to regulations. Assets can also be the wooden poles, wires and transformers that make up a utility’s distribution network, Warrington said. Utilities track these assets with geographic information system (GIS) software that can contain errors due to improper record-keeping when the assets were put in place decades ago or after they were repaired. “LIDAR can actually help detect things like lines unraveling or deterioration of insulators” that are hard to catch with grid sensors, he noted. GeoDigital can also analyze how heavily loaded individual power poles are, and use that data to optimize the deployment of new cables -- not just for electric utilities, but for other parties that want to use that infrastructure to bring telecommunications to homes and businesses. Indeed, one “well-known internet search company” is now piloting GeoDigital’s technology to help it determine which utility poles are best suited to carrying its fiber-optic cables to network cities, he said. While he wouldn’t name the company in question, Google Fiber is rolling out a network in Kansas City, with plans to expand to five more metropolitan areas -- and GeoDigital has been a Google Maps partner since 2013. Helicopter flyovers are still an expensive way to collect data, at a cost that can add up to hundreds of dollars per mile flown. But GeoDigital is also looking at using unmanned aerial vehicles, also known as drones, for similar purposes. In the past year, utilities San Diego Gas & Electric and Commonwealth Edison have won Federal Aviation Administration approval to use drones for powerline inspections. “Once we get the regulatory work around drones sorted out, if you can have these drones flying the lines 24/7, the cost of that real-time data plummets, and the real-time nature of it accelerates,” he said. “We’re in discussion with a drone company, packaging a proposal around using a drone with photography and video to do remote inspection.” LIDAR-equipped drones could be next, although “that’s quite a challenge, because you need to automate the data-collection process and miniaturize it." Finally, GeoDigital’s data-collection and analysis capabilities are also being put to use to map out highways and roads for use by autonomous vehicles, or so-called self-driving cars. “That’s one area where we will evolve additional capabilities around pattern recognition, neural networks and artificial intelligence,” he said. While Warrington didn’t go into detail on this point, the Wall Street Journal reported that GM Ventures, the venture arm of General Motors, was one of the investors in a reported $25 million funding round last year. GeoDigital didn’t disclose the amount of funding it raised, but did report that the investment was led by EnerTech Capital and Emerald Technology Ventures, along with previous investors NGP Energy Technology Partners and North Sky Capital.